In which warring ninja clans use ninjitsu to gain control over a young man's crazy ninja powers. Or, something like that! 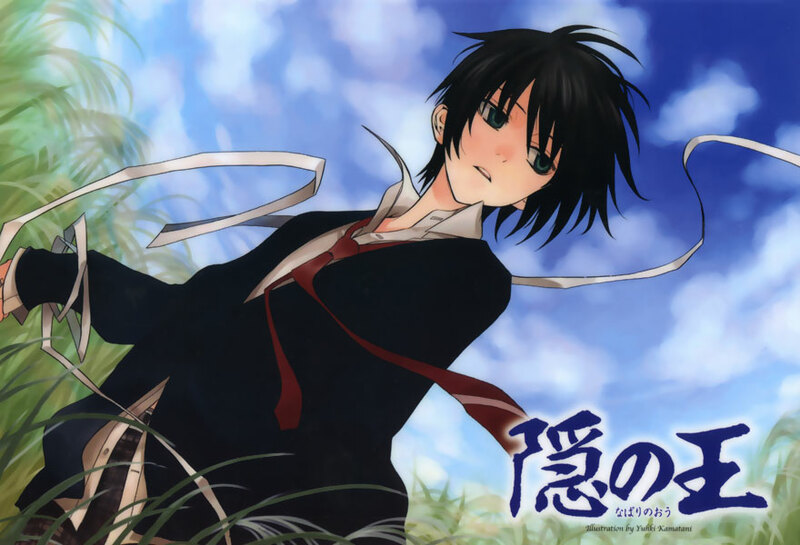 We begin the story with Miharu Rokujo an apathetic kid who lives in a small town in modern Japan with his grandparents. Surprise! He's an orphan! We learn quickly that Miharu has a special ninjitsu power within him, the Shinra Banshō, a kind of forbidden scroll type thing that appears to him as a demonic fairy. Once awakened, it will make him the most powerful ninja of all. This makes him a target for all sorts of trouble because all the ninja clans in Japan want to have control over this special power, and they will do anything to get it. Well, they will do stuff. Of course, he doesn't really want to have anything to do with ninjistu, but he doesn't have a choice. Enter characters, a lot of them. There is someone here for everybody, from teenage Samuri, to gun toting ninja gangsters, to characters with forbidden powers. They all have an interest in Miharu. If only the viewer did, too. So, yes. I will watch anything, and I did watch all 26 episodes of Nabari no Ou. Why? Because it wasn't that great; it just okay. Okay is good enough for me on a rainy weekend, so whatev-. It had the proper amounts of wind, a sneakily evil bad guy that you just wanted to be good and a ton of young ninjas. I've probably mentioned before, I like ninjas. The problem is, this anime is just kind of adequate. It is neither good nor crappy. It follows some well tread territory. The same thing has been done better and with more of a sense of angst or whimsy: Mirage of Blaze or Kyo Karah Maoh to name a couple of anime we've discussed on this site. Both feature protagonists with spotty memories and immense powers and big epic fights over those powers. The ninja clans in Nabari no Ou are a bit banal comparatively, but the characters are interesting in that they are just regular teens, young adults born into ninja clans, so this could have, if it had wanted too, turned into something of a high school dramedy. It only went there a little. Too bad. Nabari no Ou did have Yoite. I like his character. He's totally emo with his engineer's cap and his tragic dyingness and all that. He has a forbidden power called the "Kira" that allows him to kill people by focusing his chi at them. In a way it reminds me a lot of the "blood bending" tactic from that Katara from Avatar uses. Anyway, using it means he will die, because, well, you can't have a forbidden power without something bad happening to you. That's just how it is. Anyway, Miharu and Yoite form a special bond and Miharu plans to use his special power to either erase Yoite completely from ever having lived (something Yoite wants) or to save him from certain death. 26 episodes pass and they go on some adventures and ninjas f*ck some sh*t up and there is blood and stuff and brushes with the true power of the Shinra Bansho, and in the end things more or less get resolved. Wow, I didn't give it away this time. My general synopsis. This took two seasons to tell a story that could have been more deftly told in one. Oh, well, merchandising, I guess. It is easy to watch, but not that stunning. Day 16 - Favorite Mahou Shoujo Anime: Ai Enma? What the Heck is Mecha Anime?